During a rally in Ambridge, Pennsylvania on Monday afternoon, Donald Trump once again told his supporters to keep "watch" on "other communities" aiming to "steal" the election. It's a return to the conspiracy theory speculating that the 2012 election was rigged by voter fraud in Pennsylvania — specifically in Philadelphia — as well as Florida and Ohio. It has already been debunked several times, but this hasn't stopped the Republican nominee from repeatedly presenting it as a fact to his supporters, and that's dangerous. 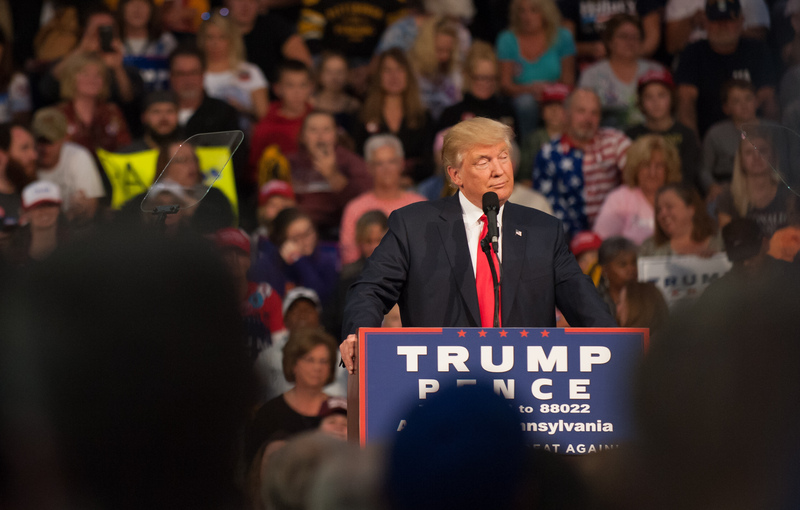 With the state being a key battleground, Trump has encouraged fears of voter fraud in Pennsylvania. "I hope you people can sort of not just vote on the eighth — go around and look and watch other polling places and make sure that it's 100 percent fine," Trump said at his rally. He continued by saying, "We're going to watch Pennsylvania. Go down to certain areas and watch and study make sure other people don't come in and vote five times." Worried about Detroit, he made similar comments in Ohio in September. With this in mind, the nominee and his surrogates are not-so-subtly encouraging racial stereotyping that could intimidate nonwhite Americans who want to cast their votes on Nov. 8. How does Trump expect his supporters to know who are the "certain" people they need to keep watch on? He doesn't have to explicitly tell them to be vigilant of racial minorities for the crowds at his rallies to get the message. Considering how many people at his events shout racial slurs, as well as the frequency of violence that tends to erupt at these rallies, Trump's words could have a dangerous result. I can only hope the state officials in Pennsylvania and Ohio have taken note of the possible intimidation that might take place on election day. Safety measures must be implemented to prevent any violence or discrimination. Any citizen who wants to vote should have the right to do so without fearing for their own well-being.